One Saturday at the beach, Laura, Juan, and Sarah decide to have a sand castle contest. As the tide rises, the walls get longer, the towers get taller, and the moats get deeper. 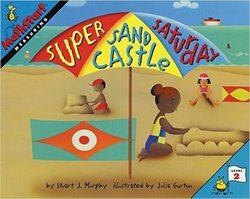 The friends measure their sand castles with spoons, shovels, and bare feet until Larry the lifeguard and his tape measure surprise them all.s.